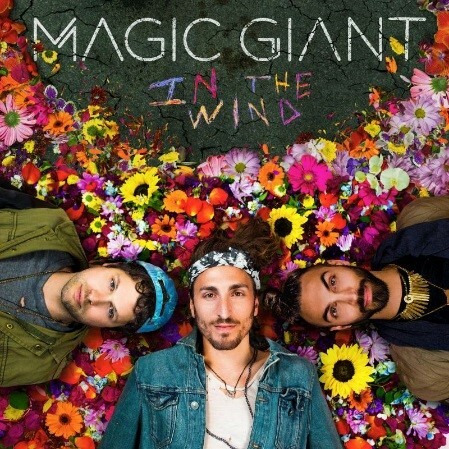 Meet the LA trio, Magic Giant! Later this week on May 19th, they will release their debut album, “In the Wind” via Razor & Tie. The album was co-produced with Ben Allen (Walk the Moon, MIA, Gnarls Barkley, Animal Collective). The band is made up of Austin Bisnow (lead vocals), Zambricki Li (banjo, violin, harmonica) and Zang (acoustic guitar, cello). 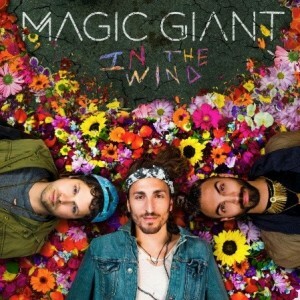 To put this new collection together, Magic Giant converted a shuttle bus into a solar-powered mobile recording studio and set out to record In the Wind. 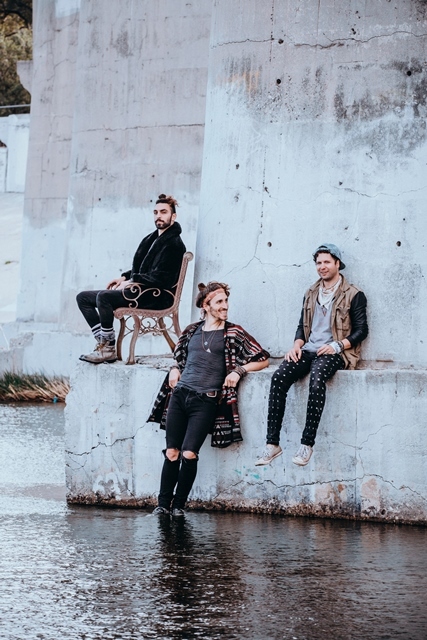 Inside a Redwood tree off the coast of California, within a tunnel by Snoqualmie Pass, on an airstrip in Marble, Colorado, and in a wild daisy field near Crested Butte are just a few of the places the trio recorded their debut. They ended their recording journey at their home studio “The Bunker,” in Silver Lake, Los Angeles. The instrumentation includes orchestral drums, banjo, trumpet, saxophone, harmonica, synthesizers, electric bass, cello, viola, violin, dobro, lap steel, mandolin, and more. The three band members found themselves serendipitously through social media, and when their virtuoso talents were combined, it created a sound that was incredibly vibrant and booming with life. “It was fate,” recalls Zambricki. 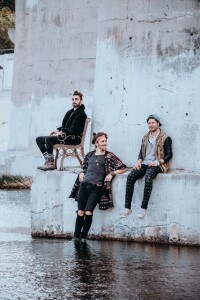 “We were scheduled to play all these festivals—Electric Forest, Wanderlust, Lightning in a Bottle—that just so happened to be in really beautiful parts of the country.” During Spring 2016, the boys bought a shuttle bus, converted it into a solar-powered mobile recording studio, added a California King on hydraulics, and fondly named her Queen Elizabeth. “There were spaces of time between shows where we could get creative,” explains Zang. “Using the bus to power microphones, we recorded outside—literally In The Wind—across North America. Last year was all about building. From our internal team to our outside community, we were building our foundation. Some personal highlights were Electric Forest and Wanderlust. We spent most of our tour in these beautiful parts of North America, recording our album and playing these festivals. We’re really proud and excited with the album we created. Can’t wait to tour all these new songs! Growing up, did all always want to be musicians? Can you recall the moment you realized that you could really make music together and be a band? How did you all first meet each other? We were actually all doing music individually before we even met so I guess it was already something we all believed we could do haha. Austin and I were already friends​ when we found Zang. We saw him playing on stage with a mutual friend, looked him up and found videos of him dancing salsa. We were mystified! So we snatched him and we’ve been best friends since. It was! There are so many bands putting music online that it’s so hard to find a great name that’s not taken. We would come up with a name that we liked, and then upon looking it up, see that there would sometimes be multiple bands that had it. Even when we came up with things that we thought were really wacky and couldn’t possibly be taken, they were. Handclap orchestra? Taken. Crayola Forest? Taken. We had a list with so many names on it! Then Austin saw a Ted Talk he shared with us of the visual artist Peter Tunney describing his mentor as a GIANT. And when he showed a photo of him, he wasn’t physically large. We thought that notion was so beautiful that you don’t have to be big to be a giant. You are just about to release your debut album, “In the Wind.” How excited are you all to finally be putting it out into the world? What was the process like of putting it together? Did anything surprise you about it all? We are beyond excited. Its our first album so we got the jitters! Writing the record and being able to play some of these songs on tour makes it so there are a ton of memories attached to both the songs and the process. A lot of this record was done as part of a summer festival tour and we were surprised how we could get a quality recording in unexpected places. Went to a studio in Atlanta after the whole epic journey to gather our thoughts and tracks together. It gave us perspective and helped bring the whole creative process together. It was fate. We had a summer of festivals in the most picturesque places around the country. We bought a turbo diesel shuttle bus and added solar panels and tricked it out to record. Instead of booking other shows in between the festivals we decided to schedule time in nature to record. Powder Mountain, Utah has a Hidden Lake where we recorded guitar on the song Jade. We also ended up writing an important part of the song there. While in Crested Butte, Colorado, we found an epic wildflower field like something out of the Sound Of Music and we got some really compelling vocals there. In Washington State there’s a 3 mile tunnel through a mountain in the Snoqualmie Pass and we got some great echoes and reverbs that we sprinkled around the album. We drove the long way from Seattle and found a redwood tree in Humboldt, California that was the size of a recording studio with the perfect reverb. Please elaborate on all the instruments that can be heard on this debut album of yours? You can hear banjo and synthesizers, string instruments like a violin, viola, and cello. Harmonica, dobro, lap steel. We experimented with unique percussion instruments like tea cups, bells, and stomps. We captured some nature and city sounds that we turned into loops and used in sections of songs. We had some amazing trumpet players on the record as well, like Spencer Ludwig and Rashawn Ross of Dave Matthews Band! Can you talk about the process of putting together your previously released tracks, “Set On Fire” and “Jade”? “Jade” was a song that we were writing on the road and it was impacted when we were told a story from the fan: her best friend passed away when she was 16 and her name was Jade. She told us she felt her presence when we played the song. Her story really touched us and we ended up completing the song with her in mind. You’ve got a pretty heavy summer tour coming up! How do you guys keep up the energy night after night? Do you have any silly or interesting rituals while out on the road? Zang likes to go salsa dancing after the shows. We started meditating together for an Atlanta and we try to get centered for each performance with a collective breath before hand. Having a healthy lifestyle on the road can be challenging, but we make it a priority. It keeps our energy up and allows us to crush shows full force every night. Where are you all excited to play at? Will this be the first time you have performed at a lot of these venues? We’re very excited to play a Firefly Music Festival in Delaware. We also can’t wait to get back to Canada for the WayHome music festival. The Bowery Ballroom in New York in June will be a blast too! We’re inspired by a variety of artists like Julian Casablancas, Alex Ebert, and Ray Lamontagne just to name a few. Our dream collaboration would be something like getting together with Queen to write a play hahah. We would’ve loved to work with Freddie Mercury. One message we resonate with is “Stuff happens; suffering is optional.” We believe in the triumph of the human will. We hope that, for just a moment, we can lift someone’s mood and create this domino effect of smiling faces. Just to come to the show, be yourself, rock out, and make sure you stop by and give us a hug. LA’s Fonda Theatre Welcomes The Inaugural ‘Strange 80s” Event Benefitting The Sweet Relief Musicians Fund!